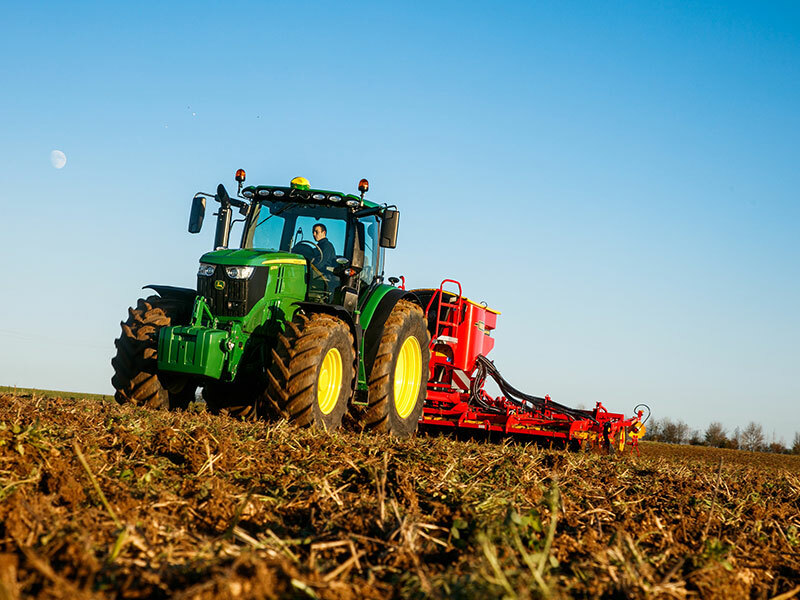 The John Deere 6250R are designed for use by contractors and large arable farmers. The new 6230R, rated at 230hp, and the 6250R, rated at 250hp, are designed for use by contractors and large arable farmers. Thanks to an engine boost of 50hp with intelligent power management (IPM), the flagship 6250R tractor provides up to 300hp when required. With a very light vehicle weight of 9.3 tonnes, the 6250R delivers more power than any other tractor in this weight class, along with an unrivalled power density of 31kg/hp. The high maximum permissible weight of 15 tonnes also allows a 5.7-tonne payload, which means the tractor is able to transport heavier loads. Both these new tractors are powered by a 6.8-litre PowerTech PSS engine with dual turbochargers and advanced diesel particulate filter (DPF) and selective catalytic reduction (SCR) technology, which responds quickly to changing loads while consuming less fuel and meeting demanding Stage IV emission standards. The upgraded AutoPowr transmission delivers maximum efficiency, with 100 per cent mechanical power available at 3.5km/h for heavy draft operations, 11km/h for light draft work, 22.5km/h for heavy transport, and 47.2km/h for light transport duties.